The Boy’s Own Paper (1879-1967) was published by the Religious Tract Society to counter the effects of penny dreadful magazines with ‘pure, entertaining, and useful reading, such as should find a place on the shelves of every Boy’s Library’. At a penny a week, the journal offered wholesome, patriotic adventure fiction by the likes of R.M. Ballantyne and Jules Verne. By the end of the century, its circulation figures were almost 250,000 and its readership stretched across the British Empire. The publishers sold Boy’s Own Annual bindings at the end of each year – priced at between seven and nine shillings, depending upon the trim – to allow owners to collate weekly issues. 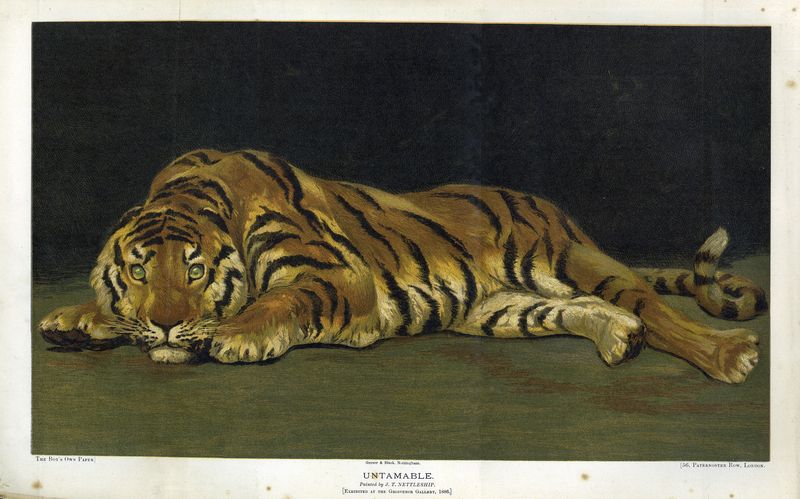 The tiger featured here was the sole coloured plate of the year 1887. [Religious Tract Society], “The Boy's Own Annual, vol. 10,” ourheritage.ac.nz | OUR Heritage, accessed April 22, 2019, http://otago.ourheritage.ac.nz/items/show/10797.